When you book a foreign trip, the last thing you want to do is worry about what will happen if for some reason you have to cancel, or if you miss your flight because you are stuck in traffic and don't get to the airport on time. Added to that is the worry of what will happen to you or your family if you fall ill or suffer an injury while on your trip. Medical treatment can be expensive in other countries, especially in the USA, and if a member of your family falls ill and you don't want them to be stuck in a foreign country where you can't be sure they are getting the best treatment, then you need to be able to get them back to the UK. Medical evacuations can cost tens of thousands of pounds, so unless you've got that kind of cash going spare, then you want to make sure that your insurance covers you. It's amazing how many people don't take out travel insurance - some believe that they are already covered by their credit card company, home insurance or some kind of private health care - and in some cases, and to some extent they are. However it's unlikely that they give the traveller and family all the cover they need. To start off, start shopping around and find the right product at the best price. Obviously, the cheaper the policy, the less cover you are likely to have. Work out how many foreign trips you are likely to take in the next 12 months. If it's only like to be one, then you'll be ok with single trip insurance. If more than this, it may be worth you taking out multi-trip or annual insurance, which will save you time shopping around for another policy a few months later, and may also be cheaper too over the long run. Cover for all the people in your party – check minimum and maximum age limits and any exclusions or restrictions concerning pre-diagnosed illnesses such as epilepsy, diabetes and heart conditions. You might also want to have cover in case you need help with legal expenses if you are unlucky enough to be injured while in a foreign country. This should include costs for compensation and/or claiming damages. Remember that the country you are travelling to may not have legal aid, so to take someone to court may end up costing you more than you’re likely to get back. Your policy may protect you if your airline goes into liquidation or administration either before or during your trip. This will at least make sure that you can get home, without forking out a fortune for a replacement flight. What you need to keep to make a claim. Make sure you keep all your receipts anyway, especially for medical bills and in the event of a burglary, get names of all those who are made aware of the situation. If you've done your research and have got all the cover you need for everyone who needs it, then you can go off and enjoy your holiday, safe in the knowledge that if something goes wrong, you will be well looked after. Even if you decide to ignore the risks and skip the travel insurance, remember that as a British citizen travelling in a foreign country you may be entitled to low cost or even free healthcare under a reciprocal agreement that the UK has with several other countries. 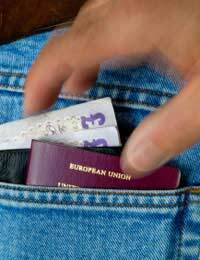 To claim your entitlement in an emergency you will need an European Health Insurance Card (EHIC).